The fitting of composite veneers usually only requires one appointment, as veneers can be made at our office, instead of being sent offsite for fabrication. 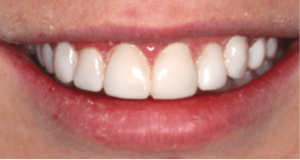 The composite resin is far less expensive than porcelain, and because it takes less time to fabricate, it is a cheaper option than porcelain veneers. 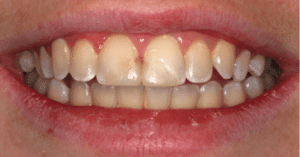 Composite veneers can be repaired if they break, porcelain veneers have to completely replaced. Porcelain veneers are, however, more durable than composite veneers. 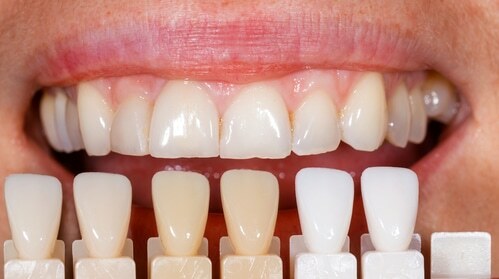 Firstly, the tooth to which your veneer will be fitted is cleaned and the enamel is smoothed. We will check for any signs of tooth decay or damage at this point. The area where the composite will be placed is then etched to create a perfect surface for a strong bond. Our expert team will then mould the composite material to fill any cavities or repair any chips or cracks. Once the composite is in place it will be set using an intensive light source. This is a completely pain-free way of creating the bond. The process usually takes less than an hour and there is often no need for needles or anesthetic. Once the composite has set it will be trimmed and shaped to ensure a perfect finish. When you’re happy with your new smile, enjoy your newfound confidence.